It turns out that you can tell a lot about a person by their first name. Why? Because parents often put a considerable amount of thought into a child's first name. The end result reflects the parents’ level of education, social background (class) and cultural preferences. You can use this to your advantage when searching for an ancestor. Deliberate Misspelling of First Names – It is not uncommon to come across a first name on an official record (such as a birth, marriage or death record) that appears to be a misspelling. Such records were, however, usually carefully recorded by a government official who was a fluent writer and who was familiar with standardized spelling. The misspelling therefore may not be a misspelling at all. It may be how the parents wanted the name spelt. A misspelling strongly suggests the parents had a low education level. Several academic studies have validated this fact by showing that working-class families tend to have more non-standard spelling variations for any given first name. Some people may find this discussion linking a person's first name to their education, wealth and race uncomfortable. We are not here to pass judgement. We are here, however, to look at creative ways to trace ancestors. We have used this method ourselves to trace our own ancestors. Social status can also be indirectly determined by looking at old photographs. A person’s clothing and surroundings often provide strong clues. 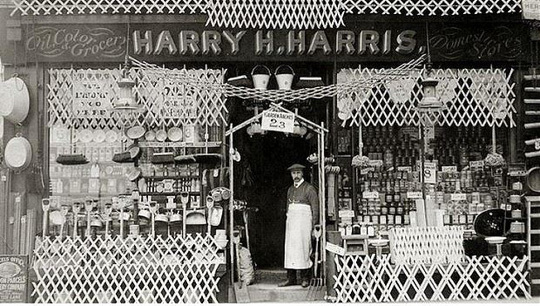 This photograph of a businessman standing in front of one of his stores in 1915 shows that for the time he had reasonably high social status. However, if the official birth, marriage or death records of such a person showed an usual spelling of a first name, it would suggest the person came from more humble beginnings. Using Nicknames as Formal Names – Another common issue is coming across what appear to be nicknames on official records. Examples would include recording Tommy instead of Thomas or Harry instead of Henry (or Harold). These are also usually not mistakes. Instead, it is what the parents wanted. Often, parents with a low education level simply did not know (or care) for example that Harry is a diminutive of Henry (or Harold). Missing Middle Names – We have not been able to find any academic study that validates this particular issue, but it is one that we have witnessed firsthand – an official record with no middle name from a time/place where most people had middle names. In this case, we strongly suspect the parents came from a working class background. The parents had simply not put any thought into giving their child more than one name. The fact that official records with a missing middle name often seem to coincide with unusually spelt first names or nicknames helps to reinforce this belief. When looking at discrepancies in the spelling of first names on official birth, marriage and death records of a single individual, it is best to focus on the birth record. The birth record is the original record because it precedes the marriage and death record in time. It is also the only record where spelling is recorded by the parents. An individual later in life can influence the spelling of names on marriage and death records. For example, a person who was born Harry might try later in life to change it on a marriage or death record to the more proper form of Harold.